Reading and share top 14 famous quotes and sayings about Marooned by famous authors and people. 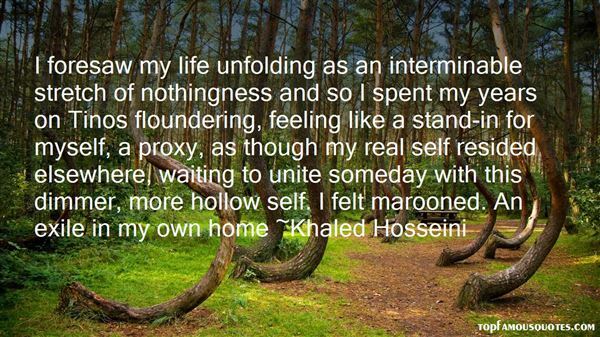 Browse top 14 famous quotes and sayings about Marooned by most favorite authors. 1. "But for a younger generation of conservative operatives who would soon rise to power... They were true believers who meant what they said, whether it was 'No New Taxes' or 'We are a Christian Nation.' In fact, with their rigid doctrines, slash-and-burn style, and exaggerated sense of having been aggrieved, this new conservative leadership was eerily reminiscent of some of the New Left's leaders during the sixties. As with their left-wing counterparts, this new vanguard of the right viewed politics as a contest not just between competing policy visions, but between good and evil. Activists in both parties began developing litmus tests, checklists of orthodoxy, leaving a Democrat who questioned abortion increasingly lonely, any Republican who championed gun control effectively marooned. In this Manichean struggle, compromise came to look like weakness, to be punished or purged. You were with us or you were against us. You had to choose sides." 2. "We're all trapped. It's always 1734. All of us, we're stuck in the same time capsule, the same as those television shows where the same people are marooned on the same desert island for thirty seasons and never age or escape. They just wear more makeup. In a creepy way, those shows are maybe too authentic." 3. "They entered the wild country. Broken fences. Ruined castles. Stretches of bogland. Wooded headlands. Turfsmoke rose from cabins, thin and mean. On the muddy paths, they glimpsed moving rags. The rags seemed more animate than the bodies within. As they passed, the families regarded them. The children appeared marooned with hunger." 4. "I guess a bit part of serious fiction's purpose is to give the reader, who like all of us is sort of marooned in her own skull, to give her imaginative access to other selves." 5. "White Sky. Trees fading at the skyline, the mountains gone. My hands dangled from the cuffs of my jacket as if they weren't my own. I never got used to the way the horizon there could just erase itself and leave you marooned, adrift, in an incomplete dreamscape that was like a sketch for the world you knew -the outline of a single tree standing in for a grove, lamp-posts and chimneys floating up out of context before the surrounding canvas was filled in-an amnesia-land, a kind of skewed Heaven where the old landmarks were recognizable but spaced too far apart, and disarranged, and made terrible by the emptiness around them." 6. "It was the day of the worms. That first almost-warm, after-the-rainy-night day in April, when you bolt from your house to find yourself in a world of worms. They were as numerous here in the East End as they had been in the West. The sidewalks, the streets. The very places where they didn't belong. Forlorn, marooned on concrete and asphalt, no place to burrow, April's orphans." 7. "If Sawtooth could put words to the brambled knot forming in his throat, he would tell her: Girl, don't go. I am marooned in this place without you. What I feel for you is more than love. It's stronger, peninsular. You connect me to the Mainland. You are my leg of land over dark water." 8. "I foresaw my life unfolding as an interminable stretch of nothingness and so I spent my years on Tinos floundering, feeling like a stand-in for myself, a proxy, as though my real self resided elsewhere, waiting to unite someday with this dimmer, more hollow self. I felt marooned. An exile in my own home"
9. "Like a White Russian drinking tea in Paris, marooned in the twentieth century, I wander back, try to regain hose distant pathways; I become too maudlin, lose myself. Weep...I sit in the chair and ooze like a sponge." 10. "It never takes longer than a few minutes, when they get together, for everyone to revert to the state of nature, like a party marooned by a shipwreck. That's what a family is. Also the storm at sea, the ship, and the unknown shore. And the hats and the whiskey stills that you make out of bamboo and coconuts. And the fire that you light to keep away the beasts." 11. "Darkness I find myself set upon a ship of fools and cast adrift.Adrift in sea of madness, steaming towards a storm of uncertainty. Overboard, swirling, twirling tumbling.Engulfed in madness. Shipwrecked, marooned. Washed upon a rock of hope. Darkness surrounds. Within the darkness madness laps upon a distant shore. Morning breaks and sun rises once more.Darkness retreats into the shadows. Golden rays of light cleanse the mind and soul. A new day dawns heralding sanity, and hopefor the human race once more." 12. "If we don't get a good day's work out of you, we'll maroon you. "He ignored Barnaby's raised eyebrow. They'd never marooned anybody before, even the English nobles they hated, but Gideon meant to put the fear of God into the man." 13. "He'd never asked for an exciting life. What he really liked, what he sought on every occasion, was boredom. The trouble was that boredom tended to explode in your face. Just when he thought he'd found it he'd be suddenly involved in what he supposed other people - thoughtless, feckless people - would call an adventure. And he'd be forced to visit many strange lands and meet exotic and colourful people, although not for very long because usually he'd be running. 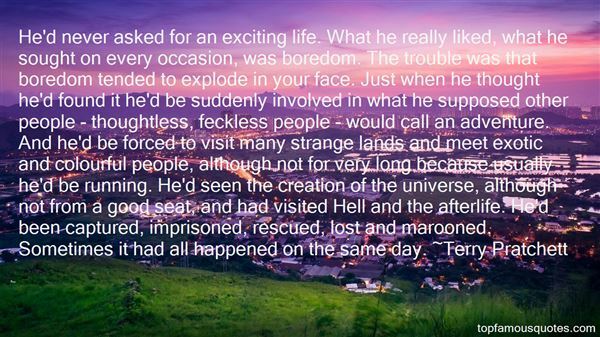 He'd seen the creation of the universe, although not from a good seat, and had visited Hell and the afterlife. He'd been captured, imprisoned, rescued, lost and marooned. Sometimes it had all happened on the same day." 14. "Captain Roberts went to Heaven, which wasn't everything that he'd expected, and as the receding water gently marooned the wreck of the Sweet Judy on the forest floor, only one soul was left alive. 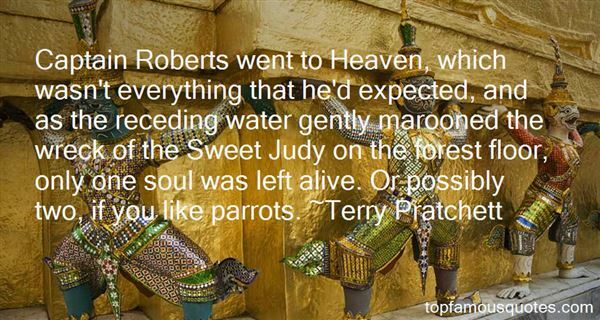 Or possibly two, if you like parrots." 'Let God be true but every man a liar' is the language of true faith."